4-Piece Children Play Tent Just $44.95! Down From $100! PLUS FREE Shipping! You are here: Home / Great Deals / Amazon Deals / 4-Piece Children Play Tent Just $44.95! Down From $100! PLUS FREE Shipping! This 4-Piece Children Play Tent is now offered at Amazon for just $44.95 down from $99.95 PLUS FREE shipping! Let your kid’s imagination run wild with this perfect 4-piece adventure play tent set. They will occupy themselves for hours at a time jumping, crawling, & playing hide-and-seek while creating memories that they will cherish forever. Children love this premium value bundle of unique tents and tunnels! 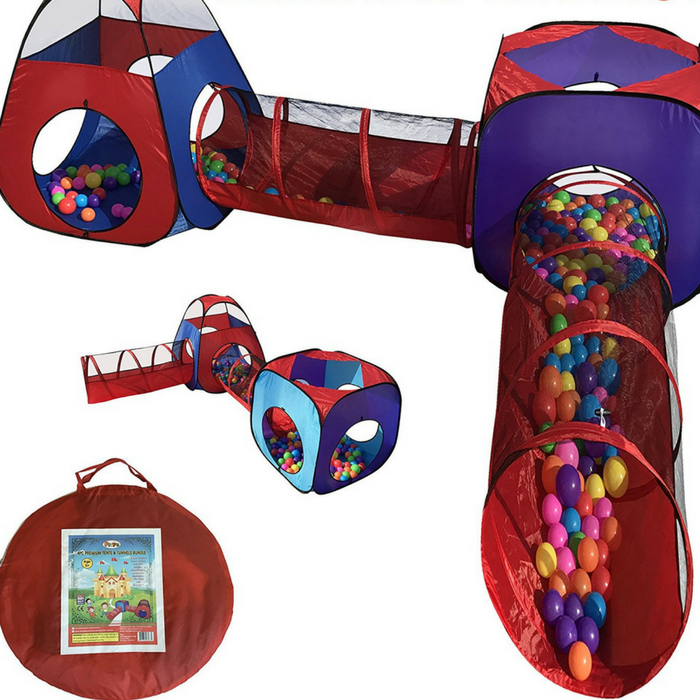 The vibrant colors and interchangeable pieces allow you to customize this multipurpose playset into many different combinations. Use it as an outdoor obstacle course on the playground or an indoor playhouse jungle gym. Hurry so you won’t miss this deal! LITTLE PEOPLE APPROVED: We were inspired by dozens of little kids opinions which led to our innovative child-friendly design. Soft thick fabric, breathable mesh walls, and flexible padded structure gives your child the safest enjoyable experience. Our special ground anchor loops allow the tents to be secured outside on a windy day. Playz® toys always meet & exceed all USA CPSC Toy Safety Guidelines.